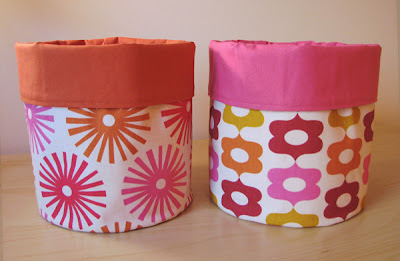 My mom sent over some adorable storage buckets she made from my fabric, now for sale in my Etsy shop! They're reinforced with very heavy interfacing which makes them so sturdy, you can set a big dictionary on top and they won't buckle. These are not tiny, wimpy buckets, no siree. Perfect for storing pretty much anything. Update: sold out in one day. But more go into the shop next week! cute! I had to share this etsy find with you because i think you'll love it. i haven't commented on here before but i check the blog every week - and i even made one of those paper wreaths you posted on a while back! Holly, how fun! Thanks for sharing. And for saying hello. Abby, Andrea, hi to you, too. Thanks! Gorgeous. Love the design and colours! WOW! How cool are these!?! Your mom rocks!!! I love this idea and your fabrics! I just posted it on my site. Thanks for sharing! Very cute! And great idea! So chic! I wish they matched something in my house! I've been wondering how to decorate the dustbins at school. These are awesome! Tell your Mom she does great work...I made some like these a couple of years ago and had a horrible time sewing the bottom to the sides, using Peltex as the interfacing that was already fused to the fabric. Tell her that inquiring minds would love to know any tips she has for assembling these! Very Beautiful. I love the fabrics!! you and your talented mom make quite a team. Candied Fabrics: Thank you for your kind words. As for tips... I completely understand what you're saying about the horrible time sewing them together! So I think you'll understand that considering how many hours it took and how much hair I pulled out trying to figure out a way to do it efficiently, I'm going to keep my "trade secret" a secret, rather than let everyone know how to do them so they can make their own instead of buying mine. (Well, if they knew, they still probably wouldn't want to make their own, but I'm not taking any chances.) ;-) All things considered, I'd say the price is a bargain as it is. I love these. I'm thinking I'll do an orange room for my daughter with these little beauties everywhere. I'm waiting for the fabric to arrive before I pick a paint color. So cute! What a talented family. You're so lucky to have a mom like that! Oh no, are they sold out? I didn't see them in the Etsy shop. I hope your mom makes some more–they're fabulous! Uh, buckets are all sold out! That was fast. But not to worry--more are in progress! Those are great! If you ever need a reviewer, I could definitely try those out for you;). I bought the last two...sorry. I had to have them and from the sounds of it they are labor intensive so wasn't sure if I could wait for round 2! SO cute! Boy do I want a sewing machine...and a few quick lessons. Then I could buy your storage buckets for all of my sewing needs. Thanks for buying, Heather... and whoever else bought the other two. It thrills me that they went so fast! And yes, there are more in the works, which I shall hand deliver to Jess this weekend, so check the shop on Monday! Normally I have to mail them to her, which adds an extra couple of days to the process, which is kind of a bummer. I love these! Your fabric is too cute! I have an award for you today on my blog. Drop by if you'd like to receive it! 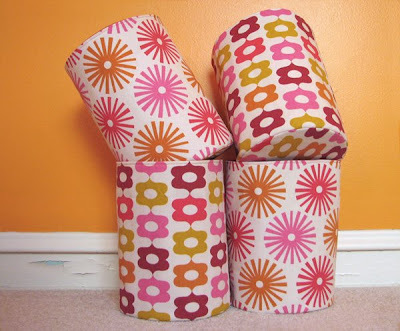 Ooh I am envious of the shoppers who snatched up the fabric buckets, they are great. Truthfully, though, I am not only jealous of your Mom's sewing expertise but that (I am guessing) she has "bolts" of your fabrics in her sewing room. How fun would that be? Probably more like folded piles, I'd say. Yeah, those original 46 yards are dwindling. But they do make for a lovely, colorful display in my sewing room! And so fun to sew on those bright colors during the dreary winter days! so great! waiting for more in your etsy shop. love the great ideas on this blog! you should makelampshades. they'd be great!